The oft-rumored Final Fantasy VII remake is probably still just a pipedream, unless Square Enix has a lot of poor spellers in its PR team. A rumor suggesting that Square Enix was planning to remake Final Fantasy VII for the NGP would seem to be nothing more than an elaborate joke. The rumor stemmed from a "leaked" email, which was supposedly sent by the Square Enix PR team, which suggested that the company was looking for translators to localize the game for different regions. According to the email, Square Enix was remaking and improving the much-loved RPG, turning it into something called "Final Fantasy VII - Enhanced Version." This new version would apparently have a number of new features including a revamped combat system similar to the one seen in FFXII, new visuals and remastered sound, and an "endless world" for players to explore. Unfortunately, while whoever put the email together went to great lengths to make it look official, some odd phrasing and a number of spelling mistakes raise some pretty significant questions about the email's authenticity. What's more, a Square Enix representative indicated to VG247 that the information contained in the email was incorrect. While that's not an official refutation of the email's claims, it does suggest that it's not an official document. You can read the email for yourself here. 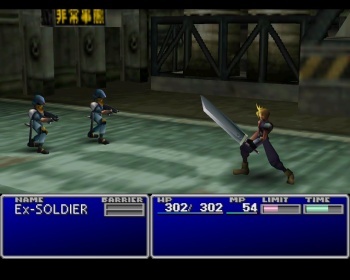 There's been no shortage of rumors about Final Fantasy VII remakes ever since Square Enix recreated the opening cut scene from the game as a tech demo for the PS3. Square Enix has repeatedly denied that it planned to update the game, although it has never completely ruled out the possibility. I hope that it's fake. Call me a raging fanboy if you must but if they do remake it, I want them to remake it on a proper home console, not on a handheld. It's like Big Boss' MGS games, I have no interest in playing them on the PSP. I'd rather they didn't remake it at all if it was going to be for a handheld. They did a pretty good job with the email, but I doubt a real email would list so many details, also I'm pretty sure Square already have a bunch of translators to work with. An email seems kind of pointless. And the FFVII fanboys fall for it again. One day they will learn, one day. Do we really need a remake? Can't they just like..Start making the FF games good again? Back to the open world, the complex and innovative plots, and oh..I don't know..getting to control all your party members in combat? XII's combat system? That'd be a terrible idea! All I've ever needed was just a re-release of FFVII over XBLA or PSN with a fresh translation that isn't quite so hard on the eyes. Why does everyone seem to deem it necessary for Square Enix to remake the whole game? I enjoyed VII but apparently not as much as the rest of the world did. I'd rather play a new RPG than one that was simply updated. Oh well, at least it was a hoax this time. Some people here don't like it when you praise FF. Even the old ones. Someone's probably going to quote you on calling the plots complex and innovative and be like "herp waht do you mean back to complex plots they never had them derp ffhatebandwagon". OT: Squeenix needs to just make up their minds and tell us if it's ever happening. Then we can either fangasm for the next few decades while it's in development hell or get over it. AN OPEN LETTER FROM THE GREAT JT. MOVE ON. Yes, Final Fantasy VII was a good game, I'm glad you like it. I enjoyed it myself. However, there is no reason for a remake! Stop begging! If you like it so much, go whip out your PS1s and play the goddamn thing! Or download it on PSN! Or hack your PSP and put it on there! Just stop asking Squeenix to wallow in the past and let them move on and make the series good again! Over 100 chocobos (whose nuts you collect and trade with friends a la pokemon) with over 25 racing tracks at the golden saucer? To say this is a hoax is an understatement, every described facet of the game is uber exagerated/ How a ff7 can fall for this is beyond me, they should know the game better then anyone else. Battle system like FFXII?!?! Thank god it's fake!! Some people here don't like it when you praise FF. Even the old ones. Even though I hate Final Fantasy, he does have a point. I actually hated it less when I was able to coordinate attacks with ALL of my team-members. OT: I wouldn't mind a remake, but its not like I would play it anyway [honestly, just release something to get the fanboys to shut up for a while! ], and even though I hate Final Fantasy, I also see how much money Square Enix would be able to make by revamping it. We had the re-release on PSN, that's nice, that's enough. - If you do make changes to fix all of that, how big do you think the odds will be fanboys flip out? - The whole Compilation of FF VII storyline is already big enough a mess as it is. We don't need a remake with possible changes and retcons. - Square Enix said it would be an expensive project. Wouldn't you rather spend that money on an exciting NEW project? They haven't made a decent FF RPG since the merger; I advise Lost Odyssey if you're not already played it. Honestly, the whole thing feels like 5th gen era Final Fantasies did, but then I suppose that's Sakaguchi at work for ya. Outside of Japan, remakes usually sell terribly. The only exception to this is Pokemon, which appealed to fans of the original by updating the engine and play mechanics, and by offering the ability to "catch them all" for kids who wouldnt know what a gameboy color was if you whacked them in a temple with it. Enix can make WAY more money by milking FFVII by releasing new, rushed, and shoddy IP involving the cast of characters. If you cut the rope and give the people what they want, you just killed a reliable source of cash. You can no longer milk the franchise if you give your fans a remake of the game they've been begging for. Ive said it a million times before, Ill say it again... Its. not. going. to. happen. anytime. soon. Get. Over. It. Yeah it's a prett bad fake it has a tone that feels like all of the content is already finished and ready to play they just need to translate it now. "...get more than 100 different Chocobo with their own abilities" I can't even think of 30 visually unique Colors let alone one hundred or what could be different abilities for each of them. Why would someone go to the effor to do this?! It's not even a very good troll. Yes. There is no need. There was also no need to remake FFIV for every single console to ever come out on God's green Earth. Yet here we are. There is no NEED for FFVII to be ported to the NGP. I don't see why it'd be such a horrible idea. If only so Liam O' Brain can voice a few more lines for Red XIII. Not saying this is legit, it's obviously a hoax but quit *****ing guys. 12 had the best combat of the ones Ive played I went back to tbc in 13 and it made me raaaage. Its too stiff and boring I liked moving around and seeing my enemies beforehand. In a more or less open changing world. 7s campaign would have been better redone like 12 because they both had open worlds with less linear gameplay. As a ff7 fanboy I have to say Im done with that games story. I mean there is no need for a remake make a new game in the 7 world by all means I just have no intention of playing a game Id make a habit of beating every summer vacation again just because its been uprezed. When SE first created the opening cutscene for the PS3, I really wanted a remake. That was then, now I say just leave it how it is. I'll just download it from PSN. Well, Nomura has repeatedly said that the Compilation is not finished yet. I'd rather they repolish the game that established the mythos rather than adding more and more crap onto it. Asides from a graphical update, the game could go for faster ATB and rebalancing among party members. Vincent and Yuffie's recruitment would have to become mandatory somehow. I dunno - I honestly think they could do well if they worked on it enough. Damn straight. And I'm 100% in agreement with those that want to be able to control the entire party in battle again. I feel sorry for SE... having to nix all these FFVII-remake rumours must be pretty annoying, week-in, week-out. And since I don't like (and never have liked!) FFVII, I'd be far, far more interested in either another non-MMO FF game, or another Kingdom Hearts game. I'm not sure that the "based in London" part of the email is true or not, one of the languages dept teachers in my school actually did work for SE as a translator... and they certainly weren't based in London. She just got a copy of whatever Squeenix wanted translating. why make the recruitment mandatory? just because its not cannon doesnt mean they cant include the cut optional quest to revive aries/aerith (whatever her name is) and give it the two possible endings the original game was intended to have Im just saying. I would love to see a Final Fantasy VIII remake for the ps3. Ugh... what's with all of the remake desire these days? Just play the original. Appreciate the original artwork, don't be a graphics whore. In my opinion, they either need to remake it from the ground up, but keep the basic game intact, or leave it alone. For those wondering, I'm talking about updated graphics, music, a revamped Materia system, and an improved combat system (But please God not like FFXII or FFXII). Since you're now wondering what kind of combat system would be good, I'd like a hybrid of FFXIII and FFX. Keep the same basic feel of characters moving around, but make it turn based in the style of FFX. This should keep the game fairly quick while allowing players to control the whole party. Limits could be done like FFX's Overdrives. Simple and elegant. EDIT: Didn't really comment on the whole hoax originally. Oops. It COULD be real, but I doubt it. Pretty sure SE said that making a RPG like FFVII would be prohibitively expensive. Therefore, they have no plans to remake FFVII. All in all, I won't hold my breath. Can play the original on my PSP anytime I want, anyways. Why FFVII? IMHO it's a tad overrated, should try for a FFIX remake instead. Probably for the best that it's most likely a rumor then.